The sub-camp Neustift (Tyrol-Austria) is mentioned for the first time on October 10, 1942, in the records of the International Search Services. It existed throughout the period of two and a half years up to May 4, 1945. The village of Neustift is located approximately 30 kilometers from Innsbruck in the Stubai Valley at a height of 993 meters in a broad valley bottom surrounded by the Stubai Alps. In September 1942, the SS High Command decided to build an SS High Mountain School at Neustift. The choice of the place was due to the fact that in November, 1939, a high mountain range, which had been set up by the Oberkommando -OKW- (High Command) of the army, was to be re-enacted as the Gebirgsjäger Schule (The Mountain Corps Military School) . SS-Obersturmbannführer Eberhard von Quirsfeld was commissioned by SS Headquarters to carry out the construction and extension, as the original facilities were too limited at Neustift for basic mountain exercises. Quirsfeld remained from 15 September 1942 until the arrival of the US troops on 3 May 1945 commander of the Hochgebirgsschule (Mountain Corps School) and at the same time, that of the sub-camp Neustift. The members of the commander's staff were Helmut Schön, the company commander Ferdinand Steiner, and a camp doctor, a camp dentist, an administrative director, the Spiess (First Sergeant), as well as a Hauptsturmführer, with a task not clearly defined. As an inspector of the Hochgebirgsschule,functioned SS Brigadeführer Karl Ferdinand Reichsritter von Overkamp. The administration of the school was subordinated to the SS-WVHA in Berlin. Together with the instructors, the school staff comprised of 60 people. The actual training at Neustift started in 1943. Brigadeführer (Generalmajor) Karl von Oberkamp was a German Waffen-SS commander and war criminal during World War II. During his SS career, he commanded the SS Division Prinz Eugen, the SS Division Nibelungen and the V SS Mountain Corps. On October 13, 1942, a transport of a total of fifty prisoners from Dachau arrived at Innsbruck, with 31 German and 19 Polish nationals. 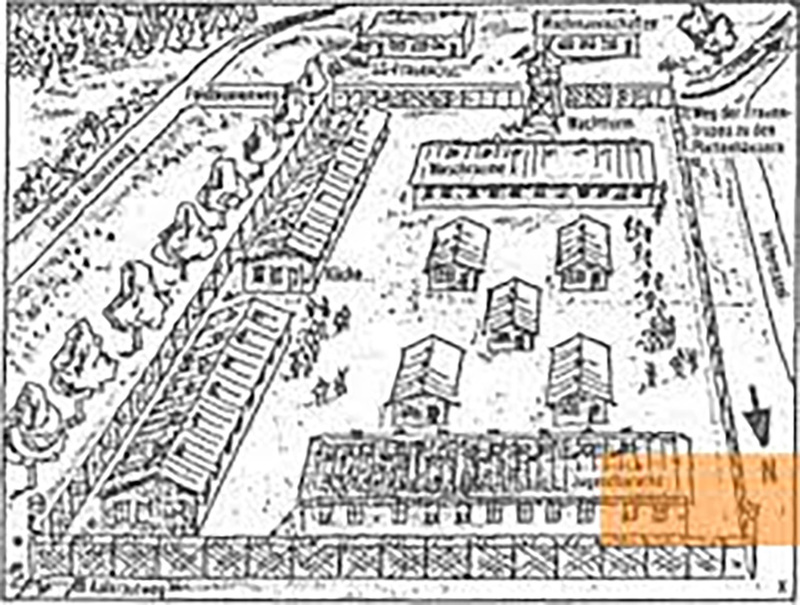 In the first two transports, 30 prisoners were divided up for the camp I (Reichsstrassebauamt) and 20 prisoners for the camp II (Fulpmes-Neustift). However, no subdivision was apparently carried out for this village, and the only sub-camp, namely the SS-Hochgebirgsschule Neustift, was the only one mentioned by the prisoners during later investigations. It was clear from the repatriation lists of December 1942 that the camp was exclusively called 'Hochgebirgsschule Neustift'. 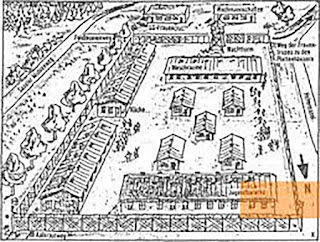 The prisoners were quartered in an existing empty barrack, which stood 50 meters away from the newly erected training barracks. These had been erected two years before on behalf of the Reich Road Construction Office (Reichsstrassenbauamt) - Innsbruck for workers of the intended Cross-Alpine Connecting Highway (Queralpen-Verbindungsstrasse) which was never materialized. The work force, which initially composed of about 60 male prisoners, was reduced to approximately 20 to 30 during the winter months. In the period between spring and autumn, the number returned to their normal strength of 60. On October 13, 1942, Karl Wagner was appointed as Kapo, who continued in this function until April 1943. He was succeeded by Hugo Jakusch, who, until the liberation of May 1845, acted as a Kapo. It was determined that Wagner was better used as overseer of the work commando as an experienced and tested bricklayer, rather than as a Kapo who as a rule did not physically work. The characterization was confined to the appointment of Kapos only, since there were neither Camp Elders nor Block Leaders, as was the case in lager sub-camps. The camp was not fenced, the prisoners who had the confidence of the commanding officer were allowed to work under guard in the village, for example, as a harvester or for household repairs. They were rewarded for this with food stuff (Naturalien) by the inhabitants, of which their guards also profited. This working commando was equipped with a kitchen,(probably a Wehrmacht portable field kitchen,sic.) The supply is described as barren but more substantial than in the parent camp (i.e Dachau). On the initiative of the Menses-daughter (Tochter) Luise Kempf, villagers at the Mesnerhaus brought together food for the prisoners. Visits by members of the prisoners, was generally forbidden, but could be held in Neustift village through the intermediary of the residents. Letters, which were also written on unofficial stationery under the commandant Wicklein, were sent uncensored via middlemen. The prisoners were also allowed to use the medical and dental care of the well-equipped High Mountain School. Two prisoners were killed in Neustift. The proceedings resulted in criminal proceedings in the years 1963 and 1973, without a guilty verdict, or any verdict, being passed. On 19 August 1943 Josef Scheiblecker was shot. The prisoner, who was missing from the Abendappell (Evening Roll Call), was found in the private apartment of a female villager who had been scammed with him. According to different witness statements, it could have been either a commissioned execution by the commanding officer Wicklein, since Sscheiblecker knew too much about him. According to another version, it was a question of jealousy between the recently transferred executioner SS-Private Hafner and the prisoner. The second prisoner returned to Neustift, he hid in the village and was discovered. Prior to be taken to Dachau, he was shot. The Kapo Hugo Jakusch fled into the mountains with a few fellow inmates at a time which was most dangerous to prisoners, just before the liberation by US troops, (enemy advance,sic) while rumors were circulating. The troops of the 7 US Army reached the Stubaital on 4 May 1945 and liberated Neustift the following day. They met 34 prisoners. At the beginning of the air raids on Nuremberg the prisoners were therefore used from the SS-Garrison in the debris clearing and the reconstruction of armaments enterprises. Hugo Jakusch and Jan Predski, both prisoners of the first transport from Dachau, remembered especially the working commando at Faun in the Wachterastrasse, which was heavily hit in August 1942. After the reconstruction within four weeks the Minister of Armament Albert Speer had promised their freedom during a visit to Nuremberg for their rapid rebuilding. Yet the two detainees were not released. In August, 1943, Faun's factory was destroyed a second time and this time it remained in ruins. After the transfer of prisoners from the KZ-Flossenbürg to the SS-Garrison Nuremberg as early as February, for some reason the SS carried on its own sub-camp as 'Nuremberg' in its administration as from June 16, 1943, while the new prisoners were termed as sub-camp KZ-Flossenbürg and kept separately administrative wise under those headings. The number of prisoners fluctuated according to the very incomparably preserved documents as a sub-camp, they fluctuated between 41 and 175, and in the later recalled memories of the prisoners, however, they claimed the figure between 100 and 300.
. The sub-camp of the SS-Garrison was evacuated in April 1945. At least 9 prisoners managed to escape. On April 26, 1945, most of the prisoners arrived at KZ-Dachau. Another part of the prisoners was probably evacuated via the KZ-sub-camp Hersbruck and then driven towards Dachau. From there, they marched then further in a southern direction. The Nuremberg SS-Garrison and their facilities was used by US Units stationed there since April 1945 until 1992. After their withdrawal, the buildinsgs were administrated by the Federal German Republic. After an elaborate reconstruction, the Federal Office for the Recognition of Foreign Refugees moved into the main building. The adjoining building, where the KZ- prisoners had been housed, was demolished to make way for a parking garage. In another sub-building, the 'Z-Bau', a self- supporting cultural center took its place. The Central Office of the Provincial Administration Authorities encouraged the process in the Nuremberger SS-Garrison, but no process took place. In the Nuremberg Memorial Culture Center, KZ-sub-camps played no role - the legacy of Nuremberg's National Socialist Regime was too exaggerated as a 'city of the Reichsparteitage' and the 'Nuremberg laws'. The story of the KZ-sub-camp of the SS-Garrison Nuremberg is, however, a part of the history of the Reichsparteigeländes and a testament to the violence of the facade of the monumental Reich-Party-Meetings, which was fascinating for many.